"...an intriguing book by Charles Kenny, an economist currently on leave from the World Bank, shows that there is more to life than GDP. The gap between the income of the world’s richest and poorest may widen but their respective qualities of life -- measured by infant mortality, life expectancy, education, the ability to communicate, civil rights, freedom from violence -- have converged. [...] The book’s first chapters are a brisk canter through the known unknowns of the study of economic development. Kenny emphasises how little we can prove about the effect of aid on economic growth, and the difficulty of transplanting governmental and legal institutions into developing countries from outside. He really gets going with an analysis of how new technologies have cut the price of quality of life, enabling billions to escape the Malthusian trap whereby higher population meant poorer people. 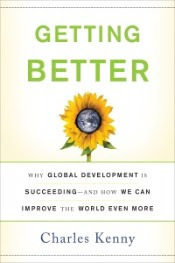 [...] Getting Better seems likely to become a canonical addition to the development literature. It sets out a manageable thesis, argues it vigorously and with optimism, realism and humility -- a refreshing combination in any field, and particularly one like international development, too often marked by hubristic confidence or histrionic despair."